Click image for closer look. 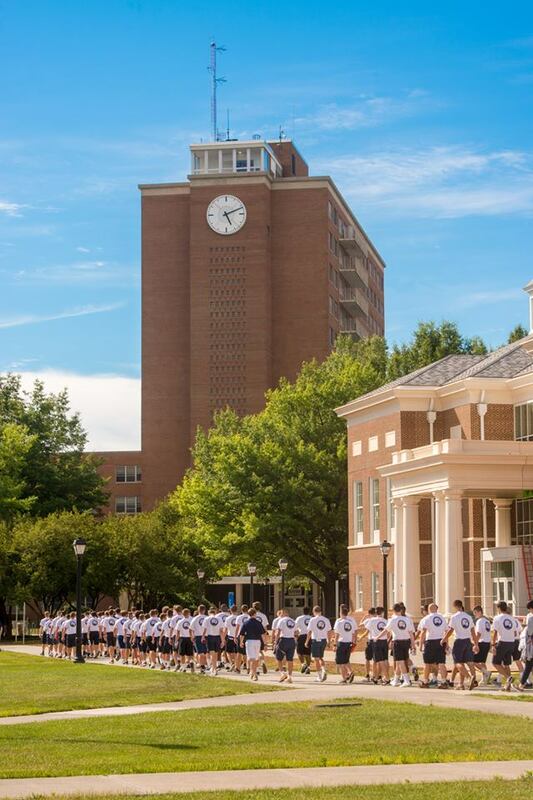 Virginia Boys State provides the opportunity to gain hands-on experience in one of three areas of government. Participants cultivate leadership skills and develop pride in American citizenship. Citizens learn the political process through the election process for the offices of the mythical 51st state. Each delegate is assigned to a political party which has no philosophy or platform until the delegates develop one. Delegates use the basic laws and procedures of the State of Virginia as a guide for their week. Speakers from all levels of government provide valuable lessons for the delegates. A highly qualified staff provides guidance and leadership. 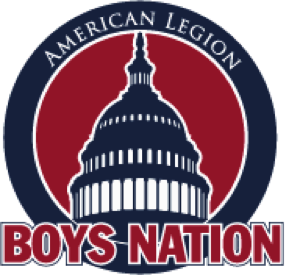 Two delegates will participate in Boys Nation held in Washington, D.C. in July. 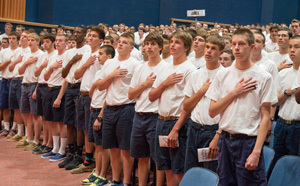 Boys State is among the most respected educational programs of government instruction for high school students. Each participant becomes a part of the operation of his local, county and state government. 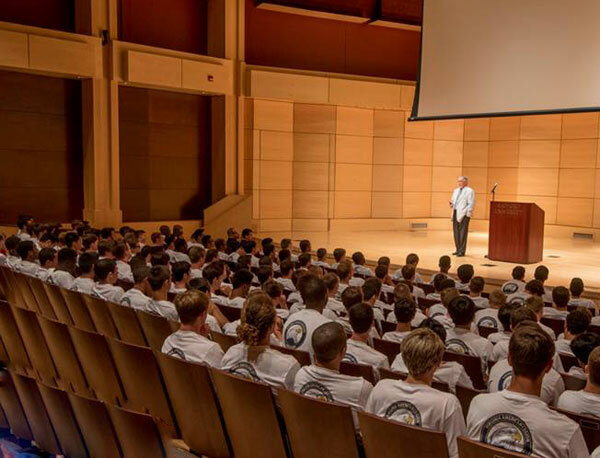 At Boys State, participants are exposed to the rights and privileges, the duties and the responsibilities of a franchised citizen. The training is objective and practical with city, county and state governments operated by the students elected to the various offices. Activities include legislative sessions, court proceedings, law enforcement presentations, assemblies, bands, chorus and recreational programs. With hands-on experience, you will create an effective political organization, operating from the local through the state level. The government organization provides for such features as city and state elections. The citizens are organized into two political parties: the Nationalist Party and the Federalist Party. Virginia Boys State is a leadership action program, designed to develop a working knowledge of the structure of government and to impress upon the citizen the fact that our government is just what we make it. Along the way they will have the opportunity to learn the political process. Each level of government will be run by those delegates who are elected to serve. Instruction will be presented on the law and court system, parliamentary procedure and Virginia political history. 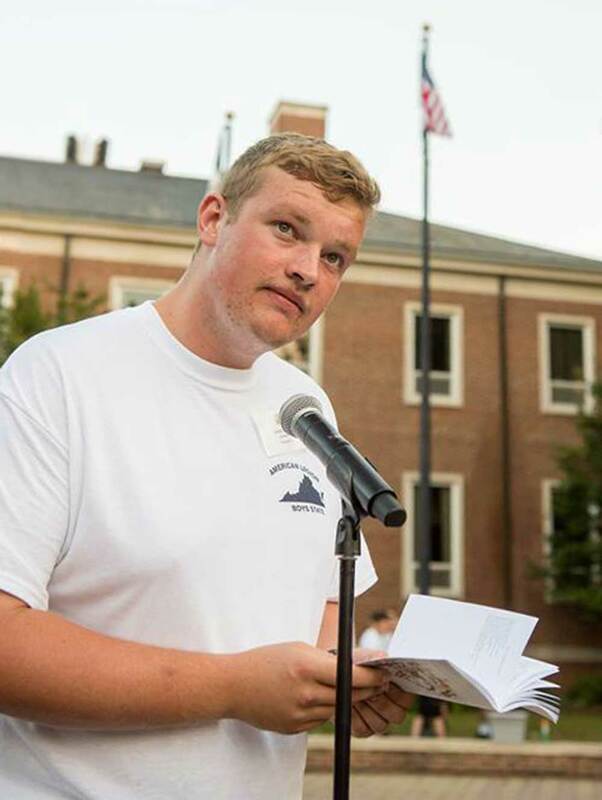 Two senators from each of the 49 Boys States represent their state at Boys Nation in Washington, D.C. each year, and two delegates from Virginia Boys State will have this honor. The selection process involves counselor recommendations and a interview process; two senators and two alternates will be selected. The program is held in Washington, D.C. during the month of July. All expenses are paid by The American Legion Boys Nation program. Within the Commonwealth of Virginia, for one week each year, a new state comes into being. 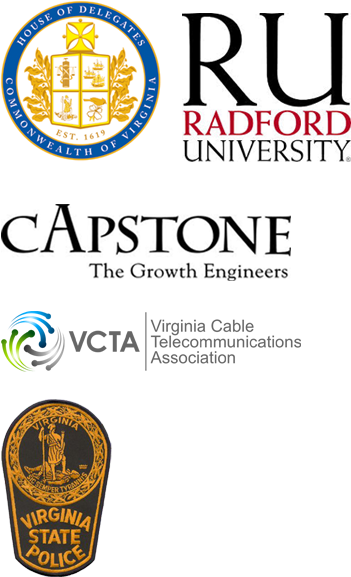 The physical boundaries of this state are the limits of the Radford University campus, but there are no limits to its usefulness in promoting real life citizenship. The youth movement known as Boys State was originally sponsored by the American Legion to counteract Pioneer Camps which were being conducted in the United States by the Nazi Freedom Foundation. Pioneer Camps taught that although the democratic form of government has served its purpose well, it was outdated and should be replaced by a fascist form of government. Legionnaires in Illinois decided to organize schools to teach youth the American way of life—AMERICANISM. They believed that youth knew the rights and privileges they enjoy under our form of government, and that they would never support any “-ism” except Americanism. The Americanism Committee of the American Legion of Illinois obtained use of the State Fairgrounds for a week in June 1935. Volunteer American Legion counselors assembled at the Fairgrounds to clean and disinfect cattle stalls, set up borrowed bunks, arrange meeting rooms, purchase food, and set up a field kitchen borrowed from the National Guard. They had contacted all the high school principals of their state and asked them to select their junior class leaders to attend the new government school to study the Constitution and the government of the state of Illinois. Two hundred and thirty five high school leaders arrived to participate in the government school. During that week, delegates were asked to suggest a suitable name for the program. The name BOYS STATE was offered by one of the delegates and unanimously adopted. Other states followed Illinois in organizing Boys State programs. In 1939, the American Legion Department of Virginia, with the cooperation of Virginia Polytechnic Institute, organized the Old Dominion Boys State. The program was not held during the war years 1942-1945. 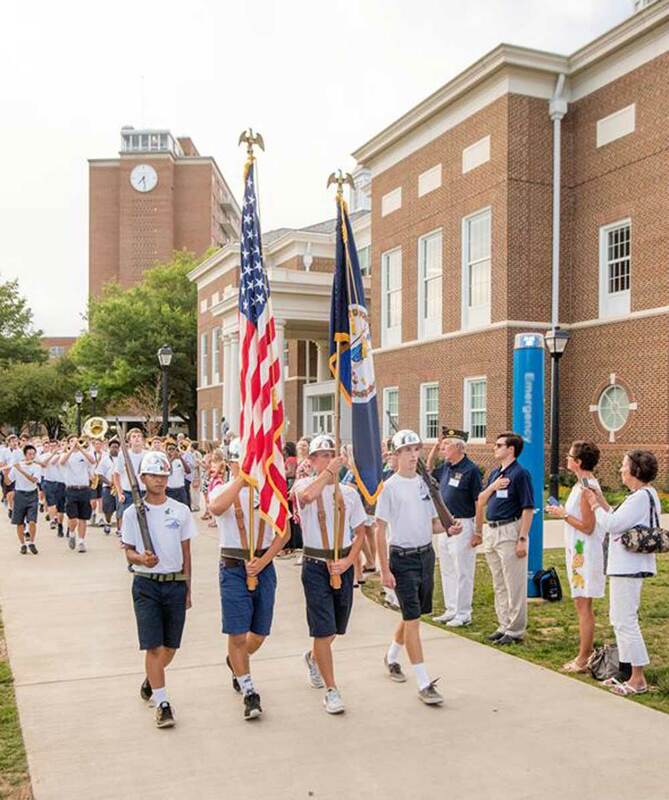 Since 1956, the official name of the program has been THE AMERICAN LEGION BOYS STATE OF VIRGINIA, INC. It currently meets each June on the campus of Radford University. The program of training has been developed on the assumption that youth can best learn by doing. The mechanics of government are patterned after those actually used in local and state governments in Virginia. Boys State is a true democracy in that all of its citizens may vote and are eligible to hold office. It aims at all times to make its programs of training in citizenship effective by creating a wide range of opportunities for participation in all forms of government. The danger of Nazism no longer exists in today’s world. Yet, our way of life is still threatened by forms of government alien to our democratic ideas as well as apathy among our own citizens. 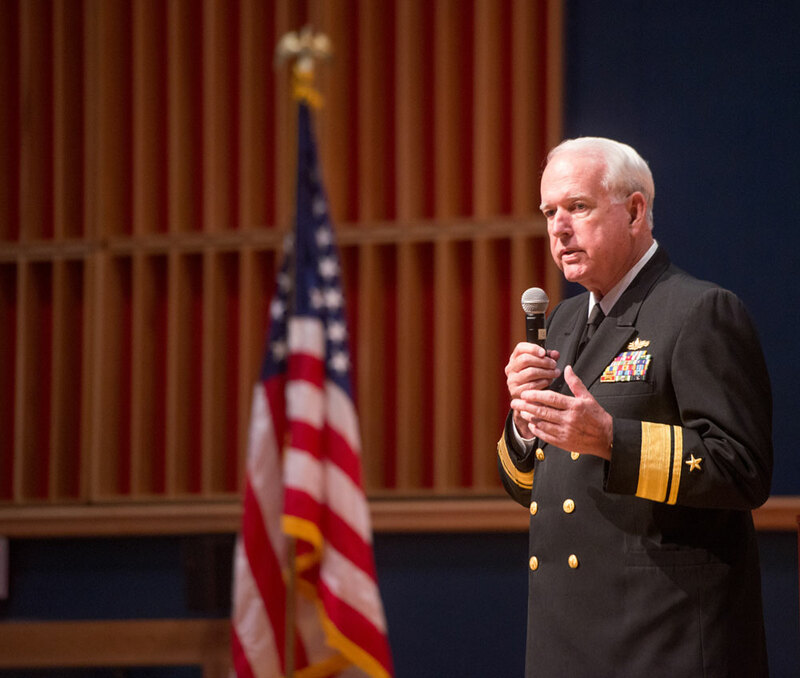 The American Legion continues to sponsor Boys State in the belief that young citizens who are familiar with the operation of our government will be better prepared to uphold its ideals. 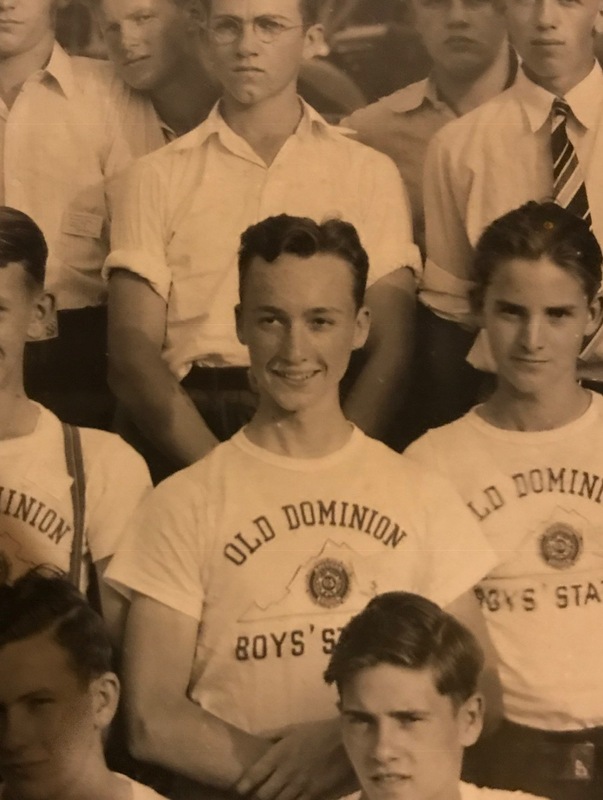 Old Dominion Boys State, Inc. was first conducted in 1939. Founder and Director: 1939-52, Judge Charles W. Crush. Past Department and Past National Vice-Commander, Lawyer, ex-member Virginia Assembly, and Judge. 1953-54, James F. Barnes, Ill Professor of Law, Washington and Lee University. 1955-75, W. Glen Rardin Assistant Director, Virginia Division War Veterans Claims. 1976-, Rex Tillotson Associate Dean of Admissions, College of William and Mary. 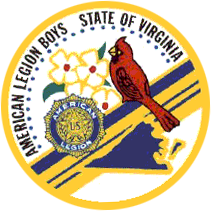 In 1956, the name was changed to The American Legion Boys State of Virginia, Inc. The program was conducted on the campus of Virginia Polytechnic Institute, Blacksburg, Virginia from 1939-63, the College of William and Mary, Williamsburg, Virginia from 1964-1972, and Lynchburg College, Lynchburg, Virginia from 1973. Boys State graduates are serving in local, state, and national public offices, as business executives, doctors, lawyers, educators, ministers, and leaders in all fields of endeavor. Former graduates include: Linwood Holton, former Governor of Virginia. Richard Poff, 20 years in United States Congress, now Federal Judge. Joe Holliman, current secretary, Virginia House of Delegates, counselor Boys State, organizes Boys State General Assembly. Glen Conrad, Federal Magistrate, counselor Boys State and supervisor of program. Thomas Peake, President Boys Nation 1957 Professor of History, King College, Bristol, Tennessee. George Blume, Ph.D., Extension Service, VPI, Boys State Counselor, 19 years and now assistant director. Andy Bradshaw, Practicing attorney, legal counselor of Boys State for 12 years. William Vest, Retired Loan Officer, Veterans Administration, Boys State Counselor for 16 years. Malcolm Minnick, Jr., Minister, in charge of North American Missions, Lutheran Church. Freedom Foundation Valley Forge Awards in 1966 and 1977. The 1982 Virginia Boys State was highlighted by the induction of Legionaires and Past-Directors of Boys State; W. Glen Rardin, A.M. “Pappy” Renick, Charles W. Crush, Founder, Arthur James, and John W. Wicker into the Boys State Hall of Fame. Recreation 3:00-6:00 p .m. daily. City Tournament play in softball, touch football, basketball and tennis. Extracurricular Activities 3:00-6:00 p.m. daily. CPR, Better Speaking and Parliamentary Law. The American Legion extends gratitude for all of the private donations and sponsors that make Virginia Boys State possible. 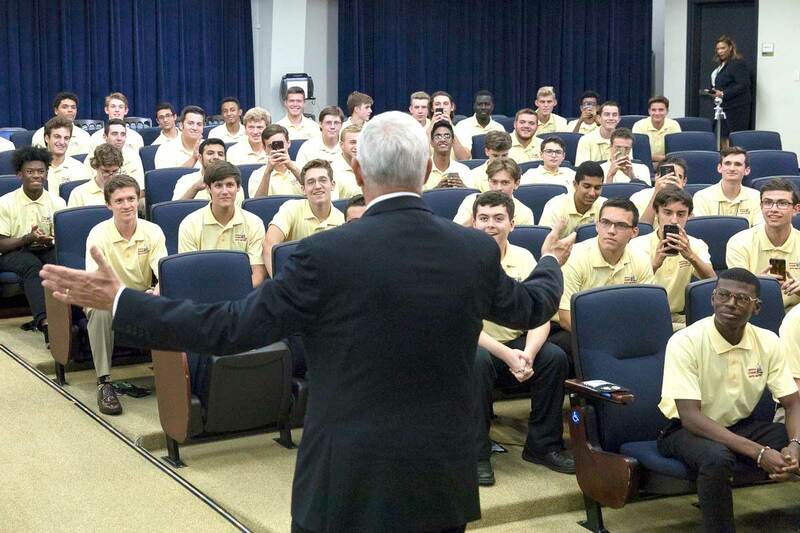 Virginia Boys State, Inc. is grateful for the participation of members and staff of our state government and their commitment to educating the next generation of citizens of the Commonwealth. We thank you for considering a donation of financial support to The American Legion Boys State of Virginia, Inc.
We operate as a tax-exempt not-for-profit educational 501(c)(3) corporation. Since no goods or services are rendered in return for a donation to Virginia Boys State, contributions are fully tax deductible. Check with your tax consultant for more information. 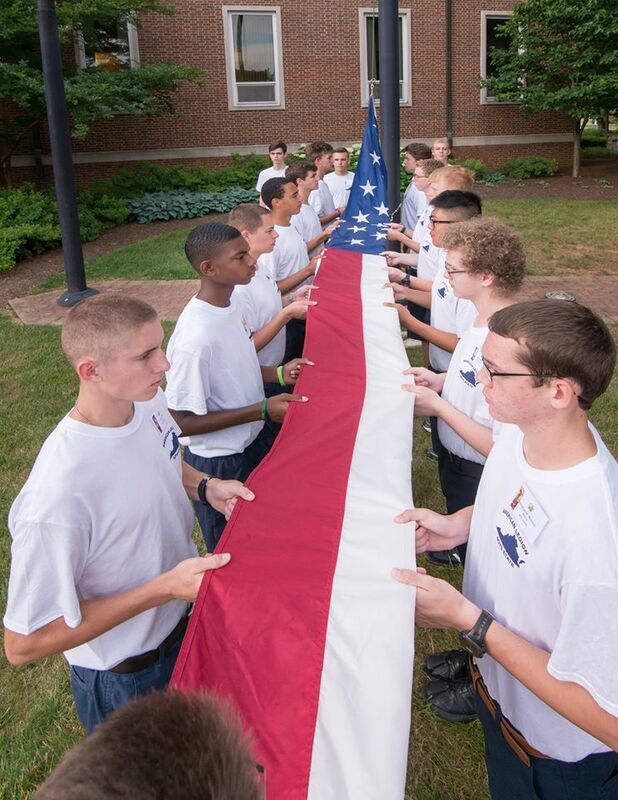 The American Legion Boys State of Virginia provides young men with a broad understanding of the privileges and responsibilities of citizenship and a better understanding of how our government works. 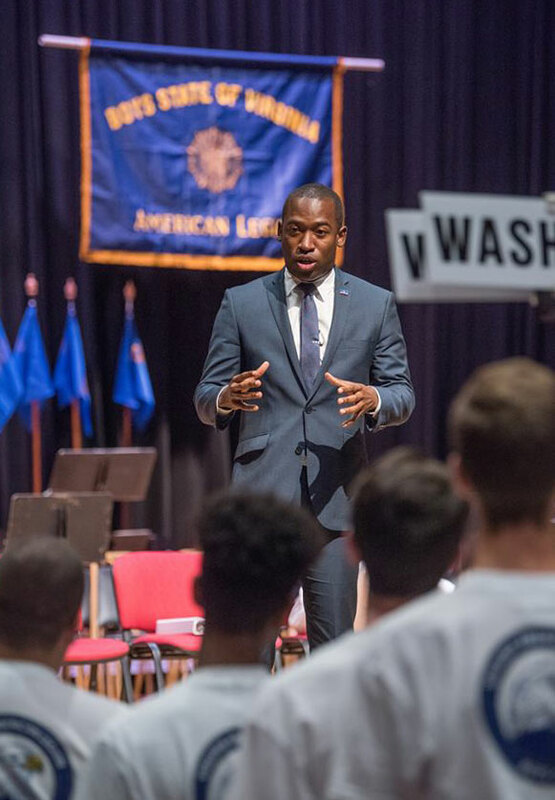 It is expected that each citizen will take the ideas and knowledge he has gained through Virginia Boys State and apply them in his own high school and community. 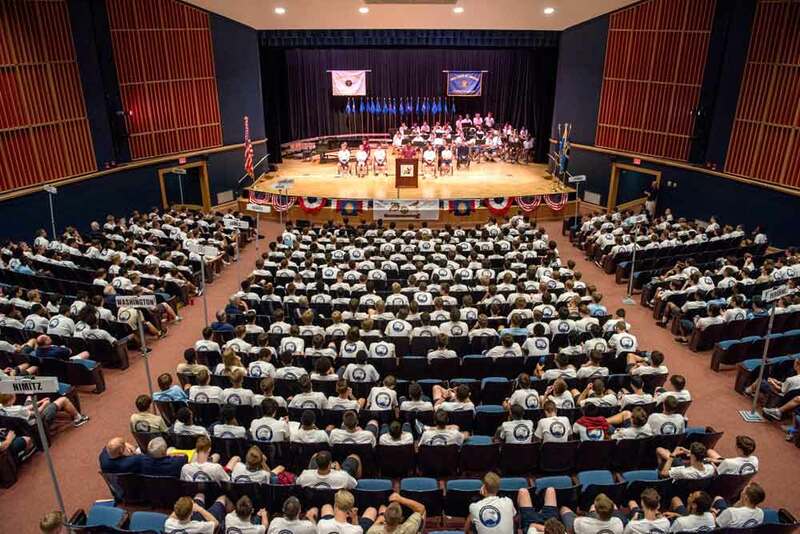 During the week of Boys State, citizens participate in a wide variety of educational and recreational activities and hear inspirational talks from both state and national leaders. Your donation funds nationally known speakers who appear at Virginia Boys State. In addition, your donation assists with registration fees for eligible delegates and funds college scholarships. A small portion of your donation also funds Boys State recruiting, administrative costs and various special projects, which enhance the Boys State experience. The benefits of becoming a sponsor include knowing that you are investing in the future of some of Virginia’s finest young men. We recognize all of our sponsors on the back cover of the commemorative annual that each participant receives at the end of the session. To make a donation electronically, please use the PayPal button below. PayPal is a safe and easy way to make a donation to Virginia Boys State. The service allows anyone to donate in any way they prefer without sharing financial information.